For seven years. Haiti Cultural Exchange has developed and grown dynamic programming toward creating a permanent presence for Haitian Arts & Culture in New York City. In 2016, the organization will take its efforts to a new stage by embarking on a plan to establish New York’s first Haitian cultural center. At this important juncture, we present Le Lambi Circle. To join the inaugural Le Lambi Circle is to answer a special call to serve as a pillar of the Diaspora community in New York City. Our aim is to bring twenty donors into this circle throughout the new year in order to ensure that we can count on the sustained support necessary to grow into a physical space that our community can call home. Le Lambi Circle members will be recognized as key supporters on HCX’s organizational materials and website. They will also be the first to be informed of important developments during this new phase. 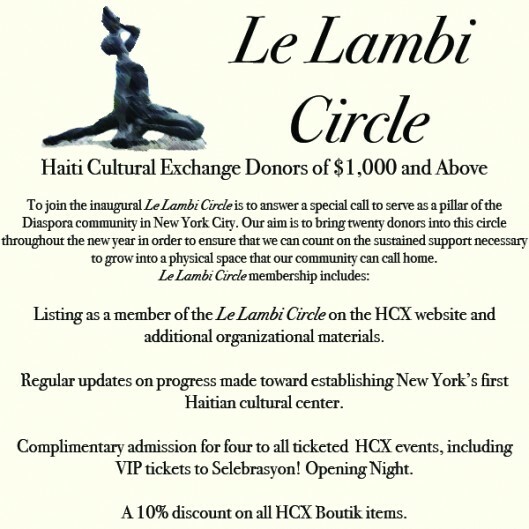 In appreciation of their commitment to the Haiti Cultural Exchange vision, Le Lambi Circle members will also receive complimentary admission to all HCX ticketed events and discounts at the HCX Boutik. If you are able, we urge you to take part in this high impact opportunity to invest in the exciting future of Haiti Cultural Exchange. Donate today to help sustain a permanent presence for Haitian Arts & Culture in NYC. Please reach out to Erika Pettersen, Development Manager, at erika@haiticulturalx.org or (347) 565 4429 in order to ask any questions you might have about Le Lambi Circle. Thank you for your continued support of Haitian arts & culture! This entry was posted on Tuesday, December 22nd, 2015 at 3:28 pm	and is filed under Benefit, Donations/Drives, Uncategorized. You can follow any responses to this entry through the RSS 2.0 feed. You can leave a response, or trackback from your own site.